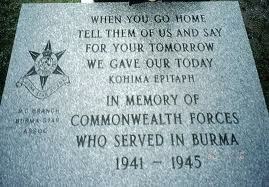 This is the famous epitaph on one of the war memorials in Kohima, the capital of Nagaland, India. The Kohima 2nd Division Memorial is maintained by the Commonwealth War Graves Commission on behalf of the 2nd Infantry Division. The memorial remembers the Allied dead who repulsed the Japanese 15th Army, a force of 100,000 men, who had invaded India in March 1944 in Operation U-Go. Kohima was a vital to control of the area and in fierce fighting the Japanese finally withdrew from the area in June of that year. According to the Burma Star Association the words were used for the Kohima Memorial as a suggestion by Major John Etty-Leal, the GSO II of the 2nd Division. Touching and yet fills us with pride that there are people who lay there life for others. 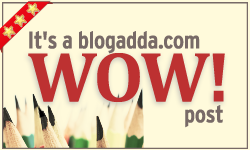 Hats off to each soldier and yes let us not forget any of the saceifises made by them. yeah a salute to all the soldiers out there who have their lives on line for their countrymen. Just makes me wonder, what have I done to make their sacrifice worthwhile.